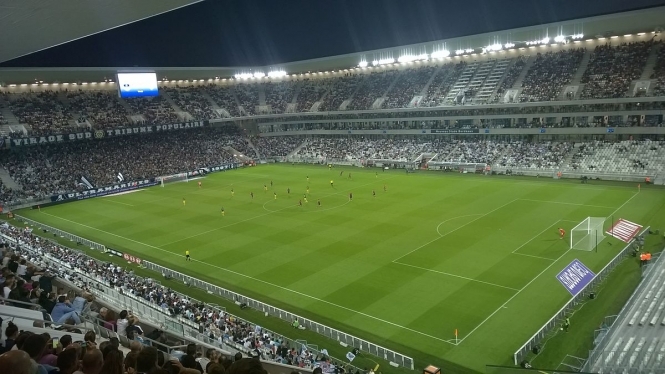 An American investment fund is in advanced talks to takeover French Ligue 1 side FC des Girondins de Bordeaux, according to reports. A deal with the club's majority shareholder, French TV broadcaster M6, could be signed, sealed and delivered as early as the summer, regional newspaper Sud Ouest reports, after the potential new owners flew across the Atlantic to join M6 CEO Nicolas De Tavernost for the 0-0 draw with Nice at the Matmut Atlantique in late February. Challenges reported last week that M6 was looking for a buyer for the Girondins, and had set a minimum price of €70million for the club before any negotiations could begin. Any new owners will also have to pay €3.45million a year until 2045 to finance the stadium, which was purpose-built for the 2016 European Championships. It is believed that businessman Joseph DaGrosa Jr, co-founder of the company 1848 Capital Partners LLC, is behind the planned buyout. Sud Ouest said that the Florida-based investors want to develop the marketing, merchandising and sponsorship side of the club. Bordeaux are currently 11th in the French domestic league. News of the planned buyout comes a day after Nice played Ligue 1 leaders Paris Saint-Germain in a rare Sunday lunchtime fixture designed to raise the profile of the French game in China, where it was broadcast live as part of a bid by the league to increase the profile of the game in Asia. In 2016, American businessman Frank McCourt, former owner of the Los Angeles Dodgers, bought French south coast club Marseille, while PSG has been owned by Oryx Qatar Sports Investments (QSi) since 2011.